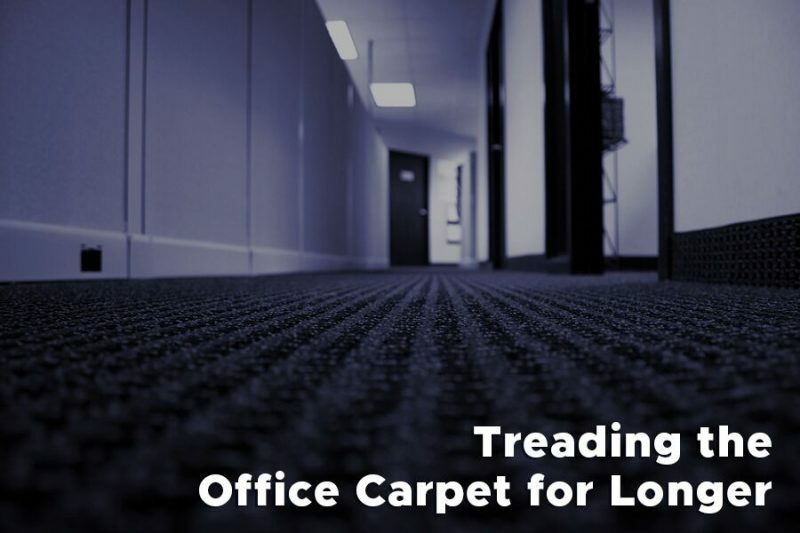 Regular cleaning of the carpet in the office can effectively remove stains, dirt, and debris and can help protect the carpet from wear and tear and damage and extend its lifespan. It is also recommended that in addition to the regular cleaning and maintenance, you employ a commercial cleaning company to professionally clean the carpets at least once every six months. The main entrance of the office is the busiest place and sees the most traffic. To help protect the carpet and make it last a bit longer, it is a good idea to use a rug or a mat at the front entrance to catch the dirt and debris that tags along. Rugs and mats may also cut down on the amount of time you spend vacuuming the office because they will catch much of the debris before it hits the main carpet in the office. Protecting the carpet from damage incurred by the furniture is also important. 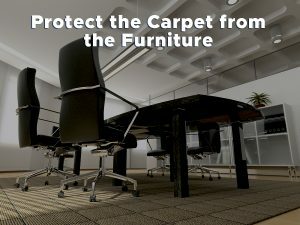 Using mats to place the chairs on can help maintain the carpet and will cut down on the risk of damage from the chair rolling and pulling the carpet fibers. As mentioned earlier, regular professional cleaning at least twice a year is a good way to keep the carpet looking new and also does a lot in the way of refreshing it and making it smell fresh and clean. If you have a busier office environment, then you may want to consider having the carpet cleaned more than just twice a year. Other than the tips above, it is also important to vacuum the carpet daily to keep it looking its best. It also prevents any of the dirt or debris from settling deep into the carpet which may make it harder to clean later. If you find that you are short on time during a typical business day but want to make sure the carpet cleaning and maintenance is not overlooked, then hiring a professional cleaning company would be in your best interest and will ensure that the carpet stays looking new and fresh for many years. 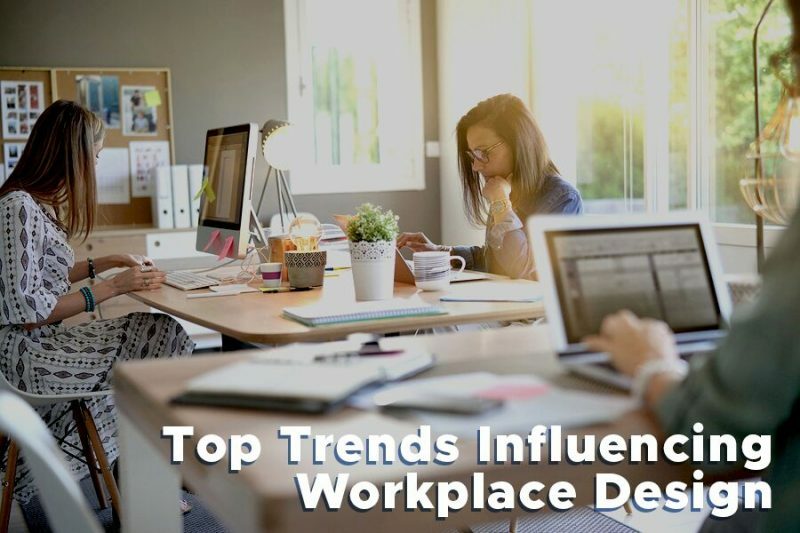 The overall design of the workplace is important when it comes to employee engagement, productivity, and satisfaction. Every business should strive to design a workplace that encourages their employees to think outside of the box and be a bit more creative and involved in what is going on in the business. Today, we see quite an increase in the number of employees that are working remotely, rather than in the office at their desk or assigned workplace. Mobility is fast becoming one of the biggest trends that is influencing workplace design. With that being said, the design of the office needs to be conducive for remote workers. Meaning, it needs to be a flexible and organized workspace that is inviting to remote workers when they come into the office, so they know where everything is, and they do not feel out of place. This will encourage them to visit the office more, while still maintaining the convenience and mobility of working remotely. A flexible and organized workspace also makes it easier for employees from other departments to come in and get done what needs to be done without the stress or hassle of not having exactly what they need. If you are able to create more activity-based workstations, you can definitely boost productivity and engagement in the office. These workstations are open for use by every employee as a shared space in which they can also work together and collaborate on projects. They also make a good place for last minute meetings or an individual workspace if one is needed with short notice. They provide a versatile space that everyone can find an appropriate use for. 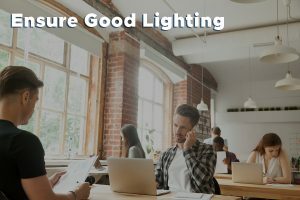 Lighting is also an essential component when it comes to the overall design of the workplace. Artificial lighting can even lead to diminished levels of productivity and can even induce fatigue. Offering more natural sunlight in the way of windows can drastically improve morale, and the sensory change can have a positive effect on workplace productivity. Finally, paying close attention to the acoustic details of the office design are also important for optimal performance and well-being in the workplace. Some employees may prefer a quiet place they can retreat to for work and thinking so being able to provide this space for them is essential. Additionally, you want an office design that will not disturb others. For example, you don’t want your meeting room to overtake the remaining workspaces because it shifts the focus of their work when they are distracted by the volume of the meeting. As an office manager, you are tasked daily with many jobs that require a fair amount of your attention and dedication to ensure that the business runs smoothly and seamlessly. You are also tasked with overseeing employees and making sure that their work is also being completed properly and in the appropriate timeframes. 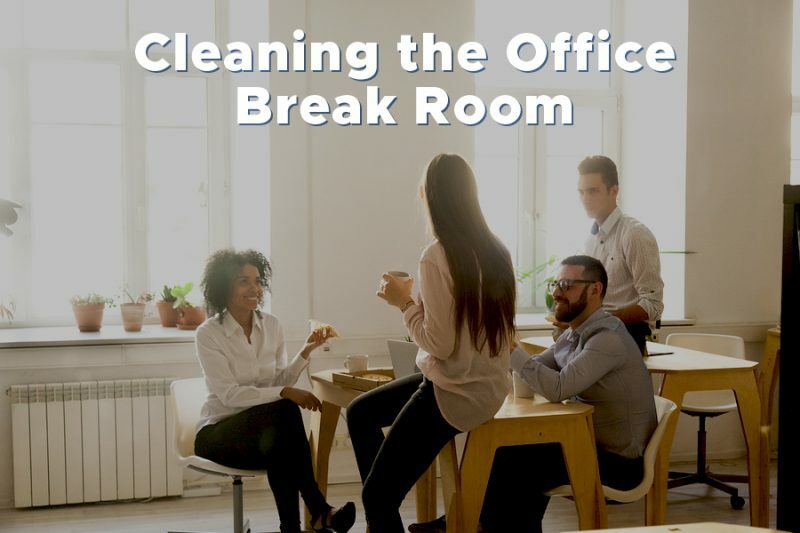 Having all this responsibility on your shoulders leaves very little time to pay any attention to the smaller details of office life, such as the cleaning and housekeeping of the work environment. This is where outsourcing janitorial services for the office may be more beneficial than you think. 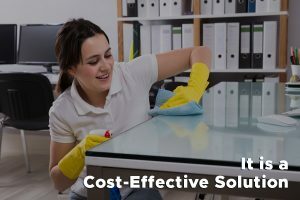 Outsourcing janitorial services is a cost-effective solution for a business because you do not have to hire or train other employees to do this work which also means that you save on benefits. The outsourced company provides the people to clean without hurting the bottom line of the business. When the cleaning and janitorial services are outsourced, you will also see a significant improvement when it comes to the overall cleanliness you see in the space. A cleaning company dedicates their time to these important housekeeping tasks that other employees may do hurriedly due to lack of time. Not having to rely on your employees to complete the janitorial tasks also means that you can successfully eliminate a variety of other issues that may arise. Having to shift the focus of the employees work to complete cleaning tasks may take their focus off what needs to be done. Doing so may also lead to rushed and poor cleaning and maintenance jobs being done on the property which can potentially lead to sickness or other workplace hazards and injury. Outsourcing these services is in the best interest for the business and can drastically free up your time to place more focus and emphasis on the overall goals of the company, rather than making sure that the environment is clean and orderly. As an office manager, it is important that you keep up to date on all the latest trends and news revolving around the office circuit. Among these trends are technology trends that are quickly sweeping through the office and establishing a big presence. A big part of the growth of a company is the tech that is employed in the office environment. Having the right tech in place can make all the difference when it comes to boosting productivity, efficiency, and even morale in the office. Flexible working is also beginning to become important in the workplace, especially when it comes to employee morale and productivity. Cloud-based technology offers the flexibility and convenience that an office manager and the employees need to easily collaborate on a document or project at any time. Including some data and automation in the business plan can help take the pressure off having to do the smaller tasks, so the focus isn’t lost on the bigger picture. While some feel that automation is taking the human interaction out of the business experience, it is a good way to improve productivity by passing off the smaller and more medial tasks. With all the current emphasis on tech in the workplace; we should not overlook the physical spaces in which we spend the majority of our workday. Living walls are a techy way to incorporate a bit of freshness and nature into the workplace to improve overall employee satisfaction. Living walls are self-sufficient vertical gardens that are attached to the wall. They allow the workplace to incorporate a little bit of beauty and inspiration to transform the space and create a more relaxing and stress-free environment to help boost productivity and morale. 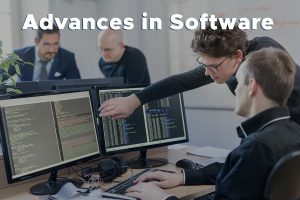 Finally, many advances are being made to the software that businesses use in the workplace. Data capture and analytics are becoming more and more important to a business and business management systems are being created and evolving to help with this facet of the company to make the office run smoothly. 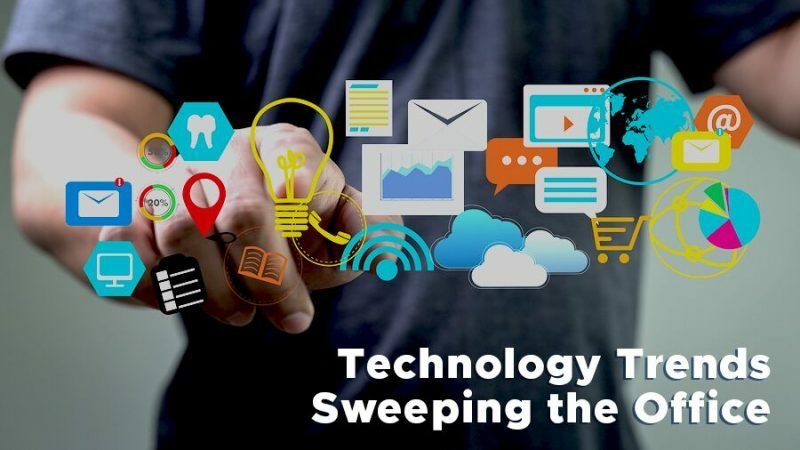 Trending technology in the workplace is always changing and evolving to compensate for the current needs of a business and tech is an essential component to the success of the business as well as ensuring a good and unobstructed flow in productivity within the workplace. Having a positive image and maintaining a good first impression are both important and high on the list of priorities for any office and office manager. Therefore, organizing the office to maintain this cleaner office image is vital to everyone’s continued success. So, what can you do as an office manager to clean up the image of your office? Read on for a few helpful tips and tricks to do just that. 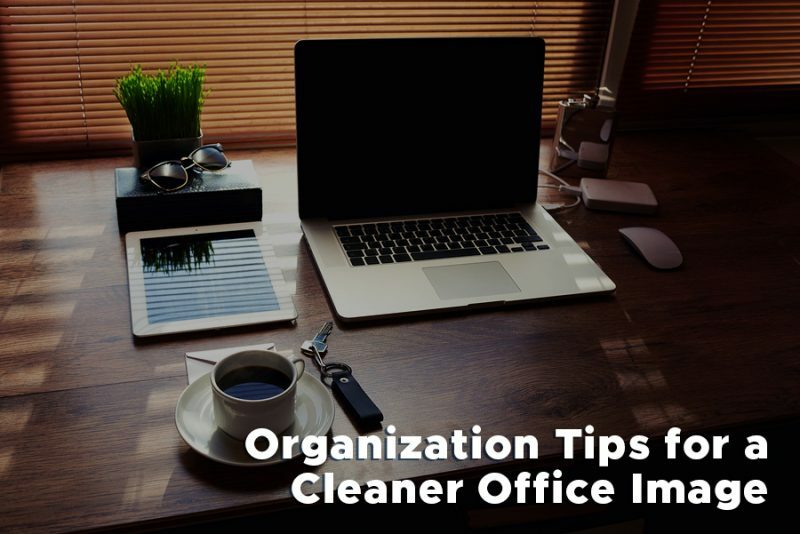 As an office manager, you have probably tried time and time again to declutter your workspace and clean up the office. 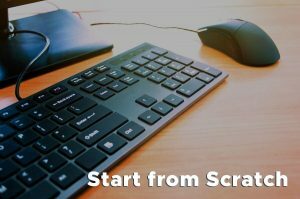 If you find yourself attempting to do this for the hundredth time, then it may be a good idea to just start from scratch. Completely clean out the workspace and then carefully decide what items you need and what items you can do without because they did nothing other than clutter the space. Doing so allows you to take some time to carefully consider each component in the workspace. When reintroducing items to your workplace, you will want to make sure that you are able to achieve good flow and balance. This means that you will want the items you use most often to be closer in reach, and items that you only use on occasion may be better suited a little further away. The last thing you want to see after organizing and decluttering a workspace is the jungle of cables twisting and winding their way around the desk. You can find clever ways to hide and clean up the cables such as running them down the length of the desk’s legs and securing them with ties. It gets them out of eye’s view and creates a much cleaner image. Finally, make sure that everything in the space has its own place and purpose. 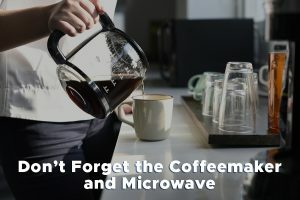 Doing so will make it a lot easier to keep it clean and organized and will make you think twice before introducing something to the space that doesn’t have a home to go to at the end of the workday. Following these easy and fool proof tips and tricks can help you create a more organized workspace which will then translate into a cleaner office image.